Hey – I only just saw an old blog post of yours about the Hare and Billet Ghost. I’m actually the guy who wrote the original message board post about it, and my friends seriously saw it before Googling. Well, they say anyway. The shadowy figure of a woman dressed in Victorian clothes still haunts the area of the Hare and Billet Road. She is thought to have been a woman who had just left her husband and was waiting for her lover, who never arrived. When she realised that she had been jilted she hanged herself from an elm tree. There’s a cached version here. 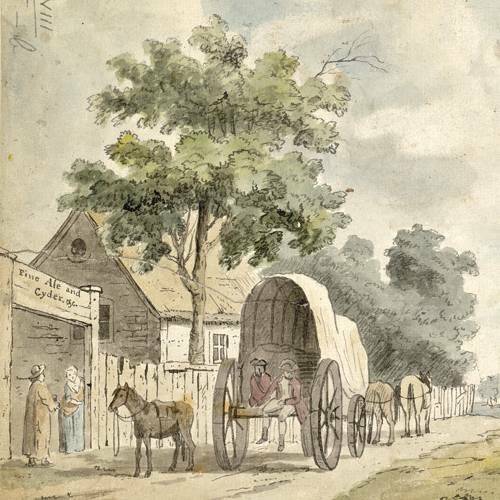 Image credit: “Near the Hare and Billet Inn” – a section from a painting by Thomas Luny (1759-1837) held in the British Library. 21 April 2005 had some info about this. Probably most of the pages listed do, but that’s just the one I happened to check on. Hare & Billet Road is not in SE10 – perhaps that is where the “modern myth” reveals its inadequacy. 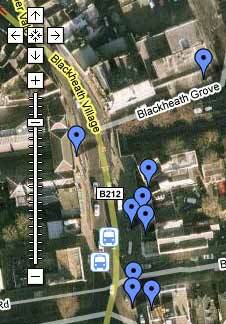 I have been told a number of ghost stories about Blackheath over the years and none survives careful investigation. Alas ….